Is this kit for both carbs or just one? This kit covers 1 carburetor. Yes, this kit does include the float, gaskets, plugs, needle, and seat. Crowley’s detailed exploded diagrams enabled me to easily find the parts that I needed for my Johnson 28. I got them ordered online, and budda-bing! — they arrived in the mail just a few days later. No problem! Great experience. Good selection of parts. Purchased numerous parts to rebuild two 1990 Johnson 70s - advice was spot-on, parts arrived quickly, one part return with no issues. THANK YOU! Service was good, price was right and the parts were good quality. Excellent web site with helpful part diagrams. Fast shipping and all items as described. Great experience with Crowley Marine. I buy my outboard annual maintenance items here. 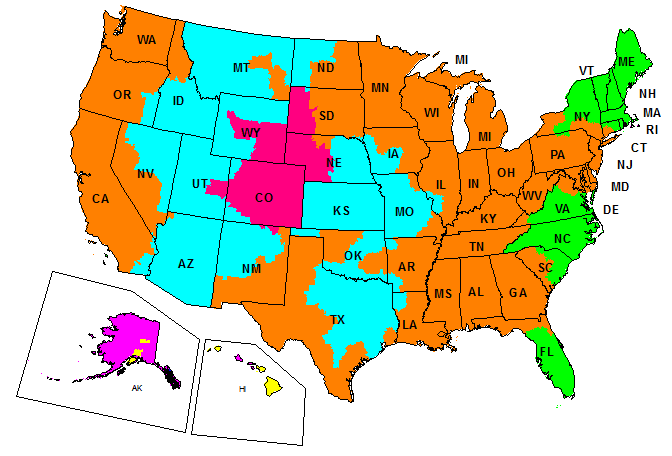 Parts are always in stock and reasonably priced. Fantastic right parts the first time and orders came quickly. 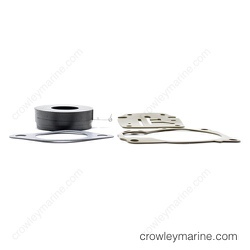 One order had a part that had to come from a supplier of Crowley Marine and that order was still delivered almost as quickly. Would definitely buy here in the future. Verry happy with there shipping, packaging and correct parts supplied. I will use them for all my future orders. good , fast updates and oem parts. Can't say enough about Crowley. Finding the right part for your motor is so easy. Great fast service. They alway have what I need,when I need it. Very happy with our customer service and order. AS always a good buying experience !! Excellent place to get parts for older engines !! It was great.. sent the right parts and fast. Excellent service. They accidently sent me one wrong part , a gasket. A quick phone call to customer service and the gasket was on the way within the hour. It arrived the second day and all is well. Overhauled two carburetors on 83 Johnson 50 HP. Had Johnson factory service manual, making it a very easy repair. 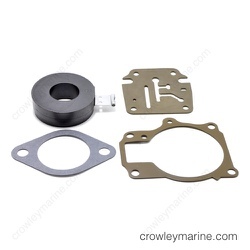 All necessary parts including gaskets, seals, float, needle valve and seat, and even BB shot plug and knockout plugs were included in overhaul kits. Took a couple hours including remove and reinstall the carbs, and cleaning them out thoroughly including all orifices, jets and all passageways. Only other items needed were gaskets for air silencer cover and air silencer base. Great experience, easy to find the correct parts for my new to me outboard. Ordered carb rebuild kits, removed carbs from engine, took apart and cleaned carbs, rebuilt with new parts/gaskets from kit, re-assembled carbs and reinstalled. Replaced some of the old fuel line at the same time. Pumped primer bulb until hard, no fuel running out the vents no leaking carbs. The website was easy to navigate, even for parts for a 1971 outboard. The product was as advertised and shipped the same day as ordered. I would not hesitate to buy from Crowley again. A portion of my order did not get shipped. I called and the company express shipped it to free. Needed help with my 1980 25hp evenruude and you came thru. Joe Urso N 2016 SatisfiedCustomer. My engine is from 1977 and I didn't think I would be able to find a carb rebuild kit, but Crowley had it. Shipping was quick too. Thanks. I'll definitely shop here again. Excellent website for someone who has never worked on an outboard. Found what I needed and got it running!! Had a chance to buy an awesome outboard-cheap....but I had to get it running. The primer was not putting out gas hardly at all and the carburetor was completely stopped up. So I got the new primer and the carburetor re-build kit. Put the primer in easy enough and watched a couple of you-tube videos on rebuilding/cleaning the carburetor. Now she sounds great!!! Good experience... Would buy again from Crowley! Great service and fast delivery. Will shop here again. Rebuilt carburator, new plugs, water pump impeller and changed oil in lower unit. Runs like a champ now. We order from Crowley all the time and they are always so great. They go above and beyond to make sure we get the product to make our customers happy . I would absolutely recommend Crowley to anyone. I'm a do it yourselfer and have used Crowley supplies when needed over the years and have never been disapointed. Removed manual starter,removed carb, rebuilt carb, then put everything back,reset air mix, finished job after checking internet for manual start problem. 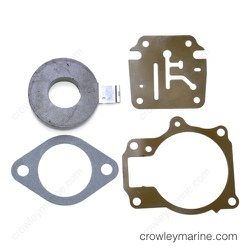 My overall experience with this store was outstanding , I had no issues with shipping and it was super fast , I was also able to purchase and find everything online with no technical difficulties , I'm overall satisfied with the Crowley Marine Parts I purchased! Sead Australia , Melbourne. 5 - This was great working with you folks. All the parts were there and even more. top notch on being able to look up parts and order, shipping is prompt. I posted a question about the part I ordered and never received a response.